Data storage is big business in today’s world. In fact, there’s a good chance all your photos, videos, documents and files are stored somewhere in the cloud. Moreover, setting up automated backups and syncing across all our devices is so effortless that we forget where this information really lives: huge data centers spread around the world. And these data centers consume a lot of energy. So how do some of the biggest energy consumers lower their carbon footprint? That’s easy: through renewable energy sources and other innovative means to keep those servers cool. These are how today’s data centers are preparing for tomorrow’s world of energy. While one mega data center may have a large carbon footprint, its use of technology and systems pales in comparison to all the servers used by small businesses across the country. As you might imagine, small-to-medium-sized companies don’t have access to the same energy-efficient technology that major corporations employ — and those on-site server rooms take up a lot of space and plenty of energy needs. Of course, the cloud isn’t just for smartphones and PC and laptop backups. Small businesses are opting out of using local storage and instead are adopting enterprise-level cloud-based services like those sold by Mozy. Removing server rooms from small-to-medium-sized companies — and instead of turning to cloud-based technology — allows data to be accessed anywhere, anytime. Anyone who has ever assembled their own PC knows there are two ways to cool a CPU — by using a heatsink and fan, or a liquid pump and radiator. The latter means is more expensive upfront but reduces heat much easier and faster. Likewise, data centers produce a lot of heat, which takes, even more, energy to cool. That’s why companies like Dell are creating innovative ways to cool servers using liquid technology. Liquid-cooled data centers usually use ground or city water from central pumps, which can use a lot of energy to distribute. But Dell’s cooling technology, which is used at data centers owned by eBay, store water in towers above the servers and let gravity do most of the work to bring it into the server racks. In the end, there’s no central pump to contend with and much less power is required. iCloud, Apple’s cloud storage system and the home to almost every uploaded photo, video and backup by iPhone users, now runs on 100 percent renewable energy. This is no easy feat, and Apple goes into great detail about how it reached that pinnacle in its 2017 Environmental Responsibility Report. You may not know that most of Apple’s data centers operate in rural areas, where huge wind and solar farms power 100 percent of their energy needs. But because Apple relies on using so much of this land, the company has made it a point to create more renewable energy sources. Major players like Google, Apple, Dell and Amazon have all committed to “going green” with Big Data. Indeed, these corporations certainly have the resources to build large solar and wind farms, but the next step in truly eliminating their carbon footprint is to improve efficiency — both in cooling and the servers themselves. The Intel Xeon, a chip commonly used in servers, consumes more energy than CPUs in your standard PC. But Intel has made efforts to reduce the required wattage with each generation of processor it develops. Reducing energy dependency by five or 10 watts may not seem like much, but multiply that by hundreds or even thousands of servers and it adds up. Small increments like these can save enterprise-level companies millions of dollars on their utility bills. Nearly 10 years ago, we talked in gigabytes, while today we talk in terabytes. And in the near future, we’ll be talking in petabytes. 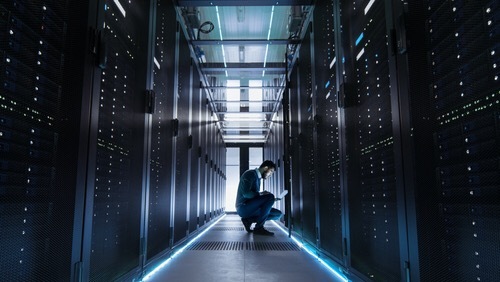 Big Data is growing exponentially, and it’s up to the big players as well as small-business owners to create new ways to power these data centers without increasing their carbon footprint. This entry was posted in IT and tagged big data, colocation, company, computer, computing, Data, data center, Datacenter, DC, dedicated, deeplearning, e-commerce, ecology, ehostidc, going green, hackers, hacking, hosting, hybrid cloud, IDC, innovation, internet, isp, Korea, machine learning, managed, marketingautomation, network, networking, NSA, robot, Robots, russians, seoul, server, servers, spying, technology, US, USA, web. Bookmark the permalink.